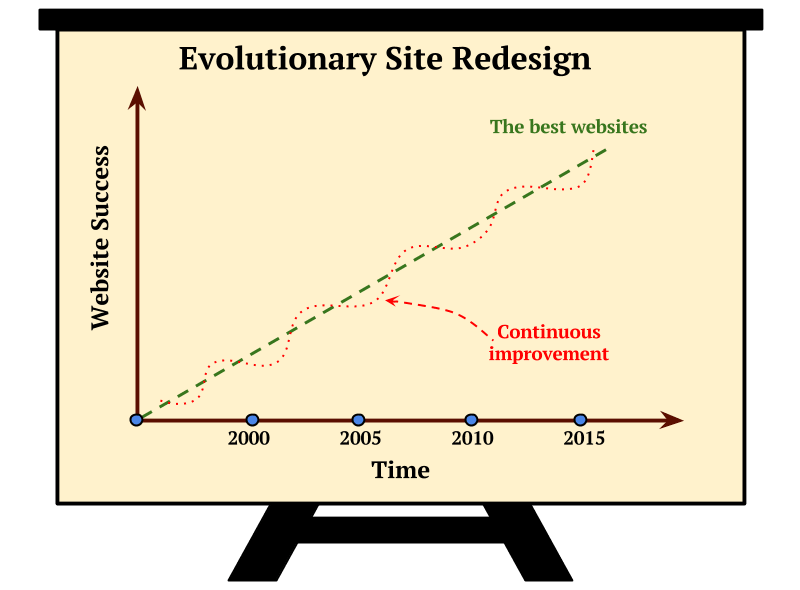 Those who monitor trends in the field of web design on regular basis know that evolutionary site redesign (ESR) beats revolutionary (RSR) approach on every level in 99% of cases. The rest 1% is left for truly outdated websites with serious lack of design and standards that require building from scratch. 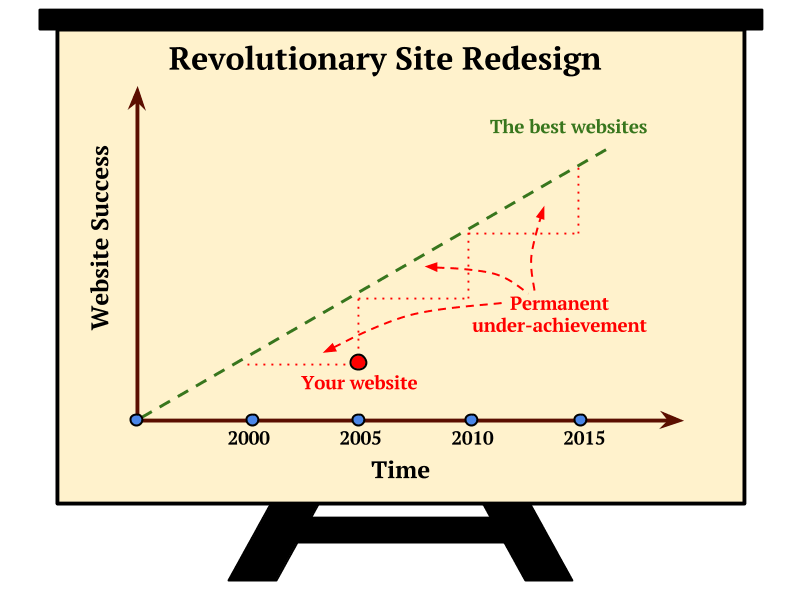 Why site redesign is necessary? Our competitors has redesigned their website. Management wants their site to be responsive. Each of these responses is essentially wrong, without a basic understanding of the present website in terms of its functionality, design, optimization, statistics, bounce rate, number of visits and other relevant factors. The key answer is actually simple: one should invest in its web site if after a certain amount of time the website itself is able to return the money invested. Speaking of investment, it is very important to distinguish the site’s main purpose, whether it is a personal web site, the local association, a musical band, alumni, university, company, media company or online store. The first would just like to have a bit of praise or ego-trip, without any other meaningful purpose, and the latter would want to convert every visit into purchase. At the beginning of each year there are planty of blogs and sites to notice web design trends which are then blindly adhere to all. To be honest, this trend is mostly dictated by the world's leading companies and services. The common goal of all more or less innovative solutions is to make the visitor feel comfortable and to provide clear call-to-action input. The redesign process requires more people i.e. a team of experts who would work on the project. Their involvement is not cheap, regardless they are being paid per hour or per project. The more complex website is - the longer would be the redesign process, and during all that time your site remains unchanged. There are countless examples that after the redesign process and drastic changes in the core site structure, search engine visibility drops significcantly, together with site ranking. The most common reasons are disturbed URI links, as well as inbound links. Another problem is the integration of trendy services and scripts, especially those related to the social networking sites. If not done properly, additional 3rd party applications can cause longer pageload and other problems. Even if a client finds a best-buy offer for a site redesign project, there is no way to determine how it will be reflected in your business success. It may be that completely out of style even after a few months, it can significantly decrease the number of visits, and therefore profit, if it is a website that promotes a particular group of products or services. When "overdone" with changes, it is not rare that a number of regular visitors simply leave the site, never come back and leave happily ever after. What is the main advantage of ESR above RSR? If we had to choose just one answer, let it be measurability. Performing gradual micro-changes on the site, with adequate A/B testing, marketeers can accurately measure all effects the site yields on the performance and visitor behavior. Constant improvements are the right way to keep site optimized, juicy-fresh, eye-catchy and up-to-date. Small changes of individual elements can be performed with more ease and less time. Some will probably say that it still costs money, which is true, but for a profitable site this is incomparably cheaper compared to hiring an entire team of experts. If these changes become frequent enough, management should consider permanent engagement of an in-house site designer. What can be redesigned on a site? Some people might find frustrating that after a serious site redesign developed according to all modern standards most clients still won’t be 100% satisfie. The fact is there is always planty of room for improvement there, and as soon as a client is reconciled with that, any further improvement will be less stressful. If possible, before any major redesign decision, one should always check whether the proportional financial investment in marketing activities and promotion of the existing site would have more effect than a single investment in a new look, or what would be the greater risk for the client.